But then, I made these. They started out as a way to scale down a classic Thanksgiving side – scalloped potatoes. I love scalloped potatoes, but trying to eat a little lighter doesn’t always go hand in hand with this dish. So when I found a recipe guaranteed to help with portion control, I was super excited. Little did I suspect that the boyfriend would take such a shine to these babies. We’re talking, hover in the kitchen going mmm…what’s that smell…what smells so good…what did you make? Usually that’s reserved for cookies, or bread, or a giant piece of meat or something, but today it was all about the potatoes. I absolutely destroyed our muffin pan (be warned, this is a messy recipe!) but thanks to the magic of cheese and potatoes (and lots of nonstick cooking spray on an already nonstick pan) I ended up with a spotless muffin tin and a very happy boyfriend who scrubbed the pan without complaint after telling me I could make those potatoes any time I wanted. I’m thinking these are my new secret weapon. 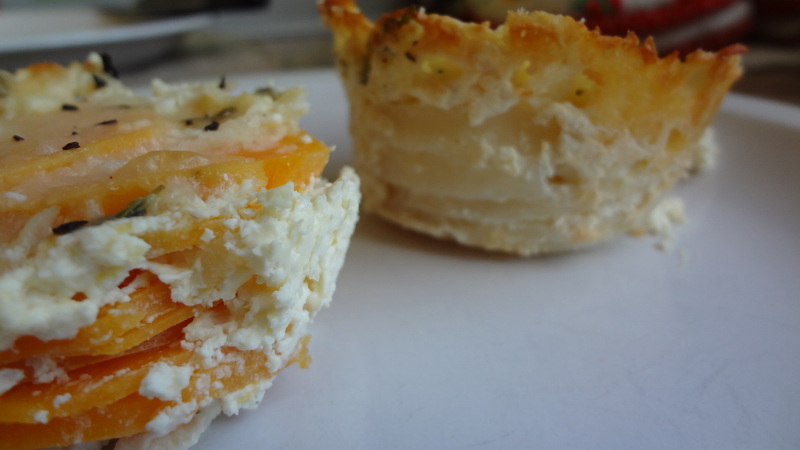 I tried them with both potatoes and sweet potatoes, and the recipe works great for both. I actually prefer the sweet potato version, but if you’re a fan of the classic, stick with a good old Idaho. 1. Preheat oven to 400°F. Grease or spray a 12 cup muffin tin really well. Peel and finely dice the garlic and shallot. 2. Place the diced garlic and shallot in a large bowl along with the half and half, 1 cup of grated Parmesan cheese, salt, pepper and thyme. Stir to combine and set aside. 3. Peel the potatoes and slice into 1/8″ thick rounds with a knife or mandolin. Stack about 7 to 8 potato slices into each muffin tin. The number of slices will vary depending on the thickness of the cut. Stack them tightly but not any higher than the muffin tin itself. 4. Next, spoon the half and half mixture into each muffin tin over the potato slices, but be careful not to overflow each tin. Big messes will follow.Loosely cover the muffin pan with foil and place in the oven. Bake for 35 minutes. 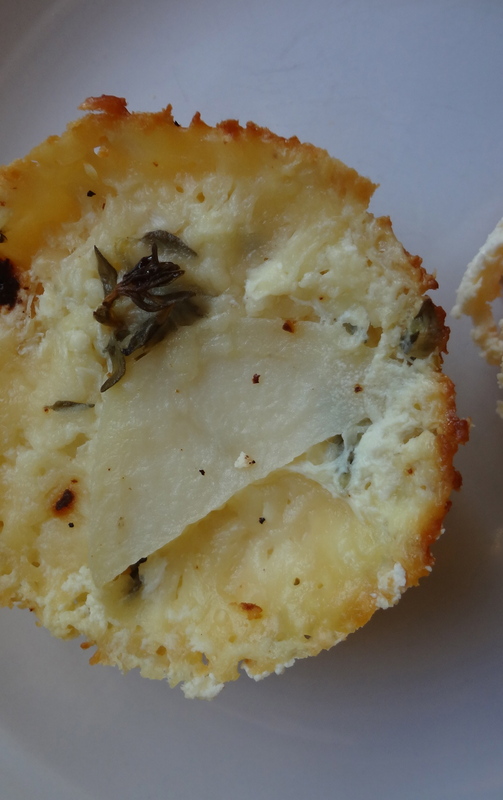 Remove the foil and carefully top each muffin tin with the remaining 1/2 cup Parmesan cheese. Place back in the oven without foil and bake for an additional 10 to 15 minutes until the cheese is golden brown, the potatoes are tender, and the liquid has absorbed. 5. Allow to cool in the pan for an additional 5 minutes, then carefully slide a knife around the edges to loosen, then remove and serve. Add additional thyme sprigs as garnish if desired. This entry was posted in Uncategorized and tagged easy scalloped potatoes, scalloped potato stacks, scalloped potatoes, scalloped sweet potatoes, Side dish, Thanksgiving by theculinarycapers. Bookmark the permalink.